Patricia Souza celebrates winning on Oct. 30. Photo/Andi Enns. Originally published in the Park University Stylus in Nov. 2012. Her eyes well with tears and her fingers fumble to flip through a sports apparel catalog in the media office of Breckon Sports Center. Patricia Souza, a 27 year old senior in international business, is an outside hitter on Park University’s women’s volleyball team. She holds the Park 25-point era records for kills in a season and over a career, despite only being on the team for two years. In August, Souza was named NAIA national player of the week -- the first women’s volleyball player in Park history to win the award. Despite her accomplishments suggesting otherwise, Souza started playing volleyball late – she was 16 when her older brother, a professional coach in Brazil, convinced her to play. Most players begin around age 10, she says. Volleyball wasn’t hard for her to pick up, she says, but she hadn’t imagined it could be more than a hobby. In fact, she didn’t even start her college volleyball career until age 22. Souza said she had her doubts. She thought Americans were unfriendly and rude – not at all like the welcoming people of her hometown Ipatinga, a city in the state of Minas Geriaes in southwest Brazil. The city is about seven hours north of Rio de Janerio. “I still don’t know why I came,” she says. She started at Indian Hills Community College, which is about two hours south of Des Moines, in 2009. She didn’t know a word of English. In her English as a Second Language classes, the teachers only spoke English, Souza said, as part of the immersion method of language instruction. Even harder than not understanding others was not being able to communicate her feelings, she says. She says her second semester was much easier, but she still didn’t have the vocabulary for the subjects she was interested in. The little English she knew, however, drastically improved her life in the US. At the end of her first year at Indian Hills, she loved the American experience. “I learned that Americans are actually very friendly,” she says. After two years at junior college, Souza was ready to transfer. She didn’t know where she wanted to go, she says. Her coach was a Park alumnus and told her about the international environment on the Parkville campus. She transferred on an athletic scholarship in 2011. Most of her friends are Brazilian, she says, because she feels homesick. She says her parents and brothers say she seems tougher than when she left. Her other friends are primarily Mongolian and American, Souza says. Though her scholarship doesn’t pay for many classes, Souza says it’s worth all of the practices and other requirements of playing for Park. Souza says she’s worried about landing a job because she’s never done an internship. Instead, she’s dedicated her life to practicing. 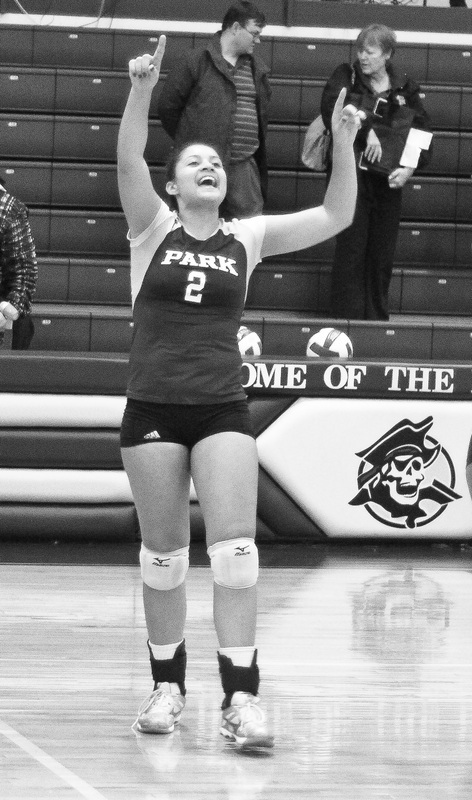 After she graduates in May, Souza says she has two dreams: one, to become a volleyball coach’s assistant at Park; and two, to pursue a career in professional volleyball. Oct. 30 marked Souza’s last game as a college player. The women’s volleyball team beat Stephens College from Columbia, Mo., in three sets, ending the season third overall in the conference. “I don’t want to think about what things will be like in this program without [Souza],” Mike Talamantes, volleyball coach, said in a press release about the game.